Pneumococcal infections are caused by Streptococcus pneumoniae, a gram-positive, catalase-negative organism commonly referred to as pneumococcus. S pneumoniae is the most common cause of community-acquired pneumonia (CAP), bacterial meningitis, bacteremia, and otitis media, as well as an important cause of sinusitis, septic arthritis, osteomyelitis, peritonitis, and endocarditis. Complications of each of these diagnoses are common. See the image below. Clinical signs and symptoms and physical examination findings alone cannot distinguish S pneumoniae disease from infections caused by other pathogens. Empyema caused by Streptococcus pneumoniae. Anteroposterior film. Courtesy of R. Duperval, MD. Antimicrobial prophylaxis (in selected patients) with recurrent otitis media. S pneumoniae is a gram-positive, catalase-negative coccus that has remained an extremely important human bacterial pathogen since its initial recognition in the late 1800s. The term pneumococcus gained widespread use by the late 1880s, when it was recognized as the most common cause of bacterial lobar pneumonia. Many subsequent studies have shown increased rates of invasive and noninvasive disease caused by serotypes not covered by the vaccine, including serotypes 15, 19A, and 33F. An analysis of over 700 cases of invasive disease in completely immunized children (PCV7) showed that 96% were due to nonvaccine serotypes. An additional 6 serotypes accounted for almost two thirds of invasive infections in this age group. An analysis of 653 invasive pneumococcal infections in the Spanish population before and after the implementation of PCV7 immunization showed an increased incidence of invasive disease in the postvaccine period, which was primarily due to nonvaccine serotypes and was associated with higher rates of complications, such as septic shock. Similar studies in the United States and other European countries have shown similar results, introducing the concept of replacement disease and its effects. Serotype 19A has received the most attention, not only because of increased disease rates associated with this serotype, but also owing to its association with increased drug resistance. Increased rates of invasive disease with such serotypes caused the overall rates of invasive disease to remain somewhat steady starting in 2002, although these rates remain greatly reduced from rates prior to introduction of the conjugate vaccine. The 23-valent polysaccharide vaccine is more effective in decreasing pneumococcal bacteremia than pneumonia. As a result, mortality rates have decreased. Ongoing surveillance will help determine the effects of widespread routine immunization with PCV13 and its expanded serotype coverage on pneumococcal disease in children and adults. The capsule is composed of polysaccharides that cover the cell wall, which is made up of peptidoglycan and teichoic acid, characterizing the classic gram positive structure; It acts as the principal antiphagocytic and protective element that prevents access of the leukocytes to the underlying cell wall elements. The capsular polysaccharides have served as means of serotyping and identifying these organisms. The Quellung reaction is the criterion standard method for pneumococcal capsular serotyping. More than 9 serotypes of S pneumoniae have been identified; currently, serotypes 6, 14, 18, 19, and 23 are the most prevalent agents that cause infections. Serotyping provides important epidemiological information, especially with the widespread use of vaccination, but rarely provides timely clinical information. The virulence of each organism is determined in part by two distinct states: opaque and transparent colony types that influence the capacity to evade host defenses. The nasopharynx is predominantly colonized by the transparent phenotype. Conversely, the opaque type predominates in lung, CNS, and bloodstream infections; it has increased capsular polysaccharide and produces more biofilm. In addition, in vitro and in vivo studies of clinical isolates have shown that pneumococci have the ability to obtain DNA from other pneumococci (or other bacteria) via transformation, allowing them to switch to serotypically distinct capsular type. S pneumoniae is an extracellular bacterial pathogen that can adhere avidly to the respiratory epithelium and mucus. It exhibits different surface proteins that recognize and attach to human cells. Pneumococcal surface protein C (PspC) binds to the poly-Ig receptor on epithelial cells, pneumococcal surface antigen A (PsaA) binds to E-cadherin on epithelial cells, pneumococcal adhesion and virulence factor A (PavA) binds to fibronectin, and enolase (Eno) binds to plasminogen that may bridge binding to host cells. Phospho-cholines interact with the receptor for platelet-activating on activated epithelial cells. Capsule, pneumolysin, and the ABC transporter Ami have also been implicated in adherence. S pneumoniae produces biofilm after binding to host cells. Biofilm production is regulated by external factors, such as temperature. Much of the clinical severity of pneumococcal disease results from the activation of the complement pathways and cytokine release, which induce a significant inflammatory response. S pneumoniae cell wall components, along with the pneumococcal capsule, activate the alternative complement pathway; antibodies to the cell wall polysaccharides activate the classic complement pathway. Cell wall proteins, autolysin, and DNA released from bacterial breakdown all contribute to the production of cytokines, inducing further inflammation. S pneumoniae remains an important pathogen in large part because of its ability to first colonize the nasopharynx efficiently. Studies performed in the United States prior to universal vaccination recommendations have shown average carriage rates of 40%-50% in healthy children and 20%-30% in healthy adults. Factors such as age, daycare attendance, composition of household, immune status, antibiotic use, and others obviously affect these numbers. [29, 30, 31] With the implementation of childhood vaccination with the heptavalent conjugate vaccine for S pneumoniae, the colonization rates have decreased in children receiving the vaccine and in adults and other children in their household because of the phenomenon of herd immunity. Most individuals who are colonized with S pneumoniae carry only a single serotype at any given time; the duration of colonization varies and depends on specific serotype and host characteristics. Invasive disease is usually related to recent acquisition of a new serotype. However, in most healthy hosts, colonization is not associated with symptoms or disease but allows for the continued presence of S pneumoniae within the population, allowing for prolonged low-level transmission among contacts. Pneumococcal colonization allows for spread of organisms into the adjacent paranasal sinuses, middle ear, and/or tracheobronchial tree down to the lower respiratory tract. This spread results in specific clinical syndromes (sinusitis, otitis media, bronchitis, pneumonia) related to the noninvasive spread of the organisms. Despite the worldwide importance of disease due to S pneumoniae infection, very little information is available on the extent of pneumococcal disease in developing countries. A review of the available literature does show an increase in reports of incidence, prevalence, complications, and vaccine effects in many areas of Europe, Asia, and Australia. Most clinical studies of pneumococcal disease show a slight male predilection for disease; the reason for this is unclear. Children younger than 2 years carry the highest burden of S pneumoniae disease worldwide. In developed countries, the incidence is highest in those aged 6 months to 1 year, while, in developing countries, the disease is particularly common in children younger than 6 months. Adults older than 55-65 years are the next most commonly affected age group worldwide. Immunosuppressed persons of any age are at a higher risk for pneumococcal disease. Pneumococcal conjunctivitis, otitis media, and sinusitis in developed countries where appropriate antibiotics are available usually carry an excellent prognosis; potential complications are listed above (see Complications). The prognosis of pneumococcal meningitis is also related in part to host factors. Most studies have shown that morbidity rates in otherwise healthy US children with meningitis are usually less than 10%; however, neurological sequelae are common. All parents should be advised of the recommendations for universal childhood immunization with the pneumococcal conjugate vaccine. Patients with medical conditions that place them at an increased risk for serious or invasive S pneumoniae disease should be educated about their condition, the potential presenting signs and symptoms of pneumococcal infection, and the need to obtain medical care promptly upon any concern for possible infection. These patients should also be educated about the benefits of the pneumococcal polysaccharide vaccine and should be encouraged to receive it. Clinical and Laboratory Standards Institute. Performance Standards for Antimicrobial Susceptibility Testing: 18th Informational Supplement. 2008. Centers for Disease Control and Prevention. Effects of new penicillin susceptibility breakpoints for Streptococcus pneumoniae- United States, 2006-2007. 2008. Available at http://www.cdc.gov/mmwr/preview/mmwrhtml/mm5750a2.htm. [Guideline] Mandell LA, Wunderink RG, Anzueto A, Bartlett JG, Campbell GD, Dean NC, et al. Infectious Diseases Society of America/American Thoracic Society consensus guidelines on the management of community-acquired pneumonia in adults. Clin Infect Dis. 2007 Mar 1. 44 Suppl 2:S27-72. [Medline]. Jain S, Self WH, Wunderink RG, Fakhran S, Balk R, Bramley AM. Community-Acquired Pneumonia Requiring Hospitalization among U.S. Adults. N Engl J Med. 2015 Jul 30. 373 (5):415-27. [Medline]. O'Brien KL, Wolfson LJ, Watt JP, et al. Burden of disease caused by Streptococcus pneumoniae in children younger than 5 years: global estimates. Lancet. 2009 Sep 12. 374(9693):893-902. [Medline]. Committee on Infectious Diseases; American Academy of Pediatrics. Pneumococcal Infections. Pickering LK, Baker CJ, Long SS, McMillan JA. Red Book 2009 Report of the Committee on Infectious Diseases. 28th. American Academy of Pediatrics; 2009. 525-335. Centers for Disease Control and Prevention (CDC). Invasive pneumococcal disease in children 5 years after conjugate vaccine introduction--eight states, 1998-2005. MMWR Morb Mortal Wkly Rep. 2008 Feb 15. 57(6):144-8. [Medline]. [Full Text]. Hsu KK, Shea KM, Stevenson AE, Pelton SI,. Changing Serotypes Causing Childhood Invasive Pneumococcal Disease: Massachusetts, 2001-2007. Pediatr Infect Dis J. 2009 Nov 21. [Medline]. Singleton RJ, Hennessy TW, Bulkow LR, Hammitt LL, Zulz T, Hurlburt DA. Invasive pneumococcal disease caused by nonvaccine serotypes among alaska native children with high levels of 7-valent pneumococcal conjugate vaccine coverage. JAMA. 2007 Apr 25. 297(16):1784-92. [Medline]. Ongkasuwan J, Valdez TA, Hulten KG, Mason EO Jr, Kaplan SL. Pneumococcal mastoiditis in children and the emergence of multidrug-resistant serotype 19A isolates. Pediatrics. 2008 Jul. 122(1):34-9. [Medline]. [Full Text]. Eiland LS. Increasing Prevalence of Pneumococcal Serotype 19A Among US Children. Journal of Pharmacy Practice. 2008. 21(5):356-62. Singleton RJ, Hennessy TW, Bulkow LR, Hammitt LL, Zulz T, Hurlburt DA, et al. Invasive pneumococcal disease caused by nonvaccine serotypes among alaska native children with high levels of 7-valent pneumococcal conjugate vaccine coverage. JAMA. 2007 Apr 25. 297(16):1784-92. [Medline]. McNeil JC, Hulten KG, Mason EO Jr, Kaplan SL. Serotype 19A is the Most Common Streptococcus pneumoniae Isolate in Children With Chronic Sinusitis. Pediatr Infect Dis J. 2009 Sep. 28(9):766-8. [Medline]. Pilishvili T, Lexau C, Farley MM, Hadler J, Harrison LH, Bennett NM, et al. Sustained reductions in invasive pneumococcal disease in the era of conjugate vaccine. J Infect Dis. 201(1). 2010 Jan 1:32-41. [Medline]. Centers for Disease Control and Prevention (CDC). Invasive pneumococcal disease in young children before licensure of 13-valent pneumococcal conjugate vaccine - United States, 2007. MMWR Morb Mortal Wkly Rep. 2010 Mar 12. 59(9):253-7. [Medline]. [Full Text]. Centers for Disease Control and Prevention (CDC). Licensure of a 13-valent pneumococcal conjugate vaccine (PCV13) and recommendations for use among children - Advisory Committee on Immunization Practices (ACIP), 2010. MMWR Morb Mortal Wkly Rep. 2010 Mar 12. 59(9):258-61. [Medline]. [Full Text]. American Academy of Pediatrics, Committee on Infectious Diseases. Recommendations for the Prevention of Streptococcus pneumoniae Infections in Infants and Children: Use of 13-Valent Pneumococcal Conjugate Vaccine (PCV13) and Pneumococcal Polysaccharide Vaccine (PPSV23). Pediatrics. July 1, 2010. 126:186 -190. [Full Text]. Burgos J, Falcó V, Borrego A, Sordé R, et al. Impact of the emergence of non-vaccine pneumococcal serotypes on the clinical presentation and outcome of adults with invasive pneumococcal pneumonia. Clin Microbiol Infect. 2012 Apr 16. [Medline]. Gubbins PO, Li C. The Influence of Influenza and Pneumococcal Vaccines on Community-Acquired Pneumonia (CAP) Outcomes Among Elderly Patients. Curr Infect Dis Rep. 2015 Dec. 17 (12):49. [Medline]. Hede K. FDA extends pneumococcal vaccine use to older children. Medscape Medical News. January 29, 2013. Available at http://www.medscape.com/viewarticle/778454. Accessed: February 11, 2013. Tucker ME. CDC Panel Endorses PCV13 Use in Immunocompromised Children. Available at http://www.medscape.com/viewarticle/779664. Accessed: February 28, 2013. McEllistrem MC, Adams JM, Patel K, Mendelsohn AB, Kaplan SL, Bradley JS, et al. Acute otitis media due to penicillin-nonsusceptible Streptococcus pneumoniae before and after the introduction of the pneumococcal conjugate vaccine. Clin Infect Dis. 2005 Jun 15. 40(12):1738-44. [Medline]. [Full Text]. Poehling KA, Szilagyi PG, Grijalva CG, Martin SW, LaFleur B, Mitchel E, et al. Reduction of frequent otitis media and pressure-equalizing tube insertions in children after introduction of pneumococcal conjugate vaccine. Pediatrics. 2007 Apr. 119(4):707-15. [Medline]. Poehling KA, Lafleur BJ, Szilagyi PG, Edwards KM, Mitchel E, Barth R, et al. Population-based impact of pneumococcal conjugate vaccine in young children. Pediatrics. 2004 Sep. 114(3):755-61. [Medline]. Henriques-Normark B, Tuomanen EI. The pneumococcus: epidemiology, microbiology, and pathogenesis. Cold Spring Harb Perspect Med. 2013 Jul 1. 3 (7):[Medline]. Kadioglu A, Weiser JN, Paton JC, Andrew PW. The role of Streptococcus pneumoniae virulence factors in host respiratory colonization and disease. Nat Rev Microbiol. 2008 Apr. 6 (4):288-301. [Medline]. Rubins JB, Charboneau D, Paton JC, Mitchell TJ, Andrew PW, Janoff EN. Dual function of pneumolysin in the early pathogenesis of murine pneumococcal pneumonia. J Clin Invest. 1995 Jan. 95 (1):142-50. [Medline]. [Full Text]. Ghaffar F, Friedland IR, McCracken GH Jr. Dynamics of nasopharyngeal colonization by Streptococcus pneumoniae. Pediatr Infect Dis J. 1999 Jul. 18(7):638-46. [Medline]. Dagan R, Greenberg D, Jacobs MR. Pneumococcal Infections. Feigin RD, Cherry JD, Demmler GJ, Kaplan SL. Textbook of Pediatric Infectious Diseases. 5th. Philadelphia, Pennsylvania: Saunders (Elsevier Science); 2004. 1: 1204-1258/90. Musher DM. Streptococcus pneumoniae. Mandell GL, Bennett JE, Dolin R. Principles and Practice of Infectious Diseases. 6th. Philadelphia, Pennsylvania: Elsevier, Churchill Livingstone; 2005. 2: 197. Lynch JP 3rd, Zhanel GG. Streptococcus pneumoniae: epidemiology and risk factors, evolution of antimicrobial resistance, and impact of vaccines. Curr Opin Pulm Med. 2010 May. 16(3):217-25. [Medline]. CDC. Streptococcus pneumoniae Disease. CDC.gov. Available at http://www.cdc.gov/ncidod/dbmd/diseaseinfo/streppneum_t.htm. Accessed: December 5, 2009. CDC. 2009 H1N1 Pandemic Update: Pneumococcal Vaccination Recommended to Help Prevent Secondary Infections. CDC. November 16, 2009. Available at http://www.cdc.gov/H1N1flu/HAN/111609.htm. Centers for Disease Control and Prevention (CDC). Bacterial coinfections in lung tissue specimens from fatal cases of 2009 pandemic influenza A (H1N1) - United States, May-August 2009. MMWR Morb Mortal Wkly Rep. 2009 Oct 2. 58(38):1071-4. [Medline]. [Full Text]. WHO Initiative for Vaccine Research Division. Acute Respiratory Infections, Streptococcus pneumoniae. World Health Organization (WHO). [Full Text]. National Center for Immunization and Respiratory Diseases / Division of Bacterial Diseases. ABCs Report: Streptococcus pneumoniae, PROVISIONAL 2008Active Bacterial Core Surveillance (ABCs): Emerging Infections Program Network. CDC. 1 September 2009. Available at http://www.cdc.gov/abcs/survreports/spneu08.htm. Goetghebuer T, West TE, Wermenbol V, Cadbury AL, Milligan P, Lloyd-Evans N, et al. Outcome of meningitis caused by Streptococcus pneumoniae and Haemophilus influenzae type b in children in The Gambia. Trop Med Int Health. 2000 Mar. 5(3):207-13. [Medline]. [Full Text]. Eskola J, Black S, Shinefield H. Pneumococcal conjugate vaccines. Plotkin SA, Orenstein WA, eds. Vaccines. 4th ed. Philadelphia, PA: Elsevier Inc; 2004. 23. Scott JA. The preventable burden of pneumococcal disease in the developing world. Vaccine. 2007 Mar 22. 25(13):2398-405. [Medline]. Fedson DS, Scott JA. The burden of pneumococcal disease among adults in developed and developing countries: what is and is not known. Vaccine. 1999 Jul 30. 17 Suppl 1:S11-8. [Medline]. World Health Organization. Weekly Epidemiological Record. March/2007. Available at http://www.who.int/wer. WHO.INT; Immunization, Vaccines and Biologicals Division. Pneumococcal Vaccines. WHO.INT. Available at http://www.who.int/vaccines/en/pneumococcus.shtml. Accessed: April 2003. Rudan I, Campbell H. The deadly toll of S pneumoniae and H influenzae type b. Lancet. 2009 Sep 12. 374(9693):854-6. [Medline]. Ajayi OO, Norton NB, Gress TW, Stanek RJ, Mufson MA. Three Decades of Follow-up of Adults After Recovery From Invasive Pneumococcal Pneumonia. Am J Med Sci. 2017 May. 353 (5):445-451. [Medline]. [Guideline] Brunton S, Carmichael BP, Colgan R, Feeney AS, Fendrick AM, Quintiliani R, et al. Acute exacerbation of chronic bronchitis: a primary care consensus guideline. Am J Manag Care. 2004 Oct. 10(10):689-96. [Medline]. Peter G, Klein JO. Streptococcus pneumoniae. Long SS, Pickering LK, Prober CG, eds. Principles and Practices of Pediatric Infectious Diseases. 2nd ed. Philadelphia, PA: Churchill Livingstone (Elsevier); 2002. 739-746/131. Worsoe L, Caye-Thomasen P, Brandt CT, Thomsen J, Ostergaard C. Factors associated with the occurrence of hearing loss after pneumococcal meningitis. Clin Infect Dis. 2010 Oct 15. 51(8):917-24. [Medline]. Waddle E, Jhaveri R. Outcomes of febrile children without localising signs after pneumococcal conjugate vaccine. Arch Dis Child. 2009 Feb. 94(2):144-7. [Medline]. [Full Text]. Stoll ML, Rubin LG. Incidence of occult bacteremia among highly febrile young children in the era of the pneumococcal conjugate vaccine: a study from a Children's Hospital Emergency Department and Urgent Care Center. Arch Pediatr Adolesc Med. 2004 Jul. 158(7):671-5. [Medline]. [Full Text]. Bradley JS, Kaplan SL, Tan TQ, Barson WJ, Arditi M, Schutze GE, et al. Pediatric pneumococcal bone and joint infections. The Pediatric Multicenter Pneumococcal Surveillance Study Group (PMPSSG). Pediatrics. 1998 Dec. 102(6):1376-82. [Medline]. Simons M, Scott-Sheldon LAJ, Risech-Neyman Y, Moss SF, Ludvigsson JF, Green PHR. Celiac Disease and Increased Risk of Pneumococcal Infection: A Systematic Review and Meta-Analysis. Am J Med. 2018 Jan. 131 (1):83-89. [Medline]. Schurder J, Goulenok T, Jouenne R, Dossier A, Van Gysel D, Papo T, et al. Pneumococcal infection in patients with systemic lupus erythematosus. Joint Bone Spine. 2017 May 18. [Medline]. van der Eerden MM, Vlaspolder F, de Graaff CS, Groot T, Jansen HM, Boersma WG. Value of intensive diagnostic microbiological investigation in low- and high-risk patients with community-acquired pneumonia. Eur J Clin Microbiol Infect Dis. 2005 Apr. 24 (4):241-9. [Medline]. American Academy of Pediatrics Subcommittee on Management of Acute Otitis Media. Clinical Practice Guideline: Diagnosis and management of acute otitis media. Pediatrics. 2004 May. 113(5):1451-65. [Medline]. [Full Text]. Anevlavis S, Petroglou N, Tzavaras A, Maltezos E, Pneumatikos I, Froudarakis M, et al. A prospective study of the diagnostic utility of sputum Gram stain in pneumonia. J Infect. 2009 Aug. 59(2):83-9. [Medline]. Casado Flores J, Nieto Moro M, Berrón S, Jiménez R, Casal J. Usefulness of pneumococcal antigen detection in pleural effusion for the rapid diagnosis of infection by Streptococcus pneumoniae. Eur J Pediatr. 2010 May. 169(5):581-4. [Medline]. Chavez MA, Shams N, Ellington LE, Naithani N, Gilman RH, Steinhoff MC, et al. Lung ultrasound for the diagnosis of pneumonia in adults: a systematic review and meta-analysis. Respir Res. 2014 Apr 23. 15:50. [Medline]. [Full Text]. Cunha BA. Pneumonia Essentials. 2nd ed. Sudbury, MA: Jones & Bartlett, Publishers; 2010. Fung HB, Monteagudo-Chu MO. Community-acquired pneumonia in the elderly. Am J Geriatr Pharmacother. 2010 Feb. 8(1):47-62. [Medline]. Johnstone J. Review: pneumococcal vaccination is not effective for preventing pneumonia, bacteraemia, bronchitis, or mortality. Evid Based Med. 2009 Aug. 14(4):109. [Medline]. Johnstone J, Eurich DT, Minhas JK, Marrie TJ, Majumdar SR. Impact of the pneumococcal vaccine on long-term morbidity and mortality of adults at high risk for pneumonia. Clin Infect Dis. 2010 Jul 1. 51(1):15-22. [Medline]. Luján M, Gallego M, Belmonte Y, Fontanals D, Vallès J, Lisboa T, et al. Influence of pneumococcal serotype group on outcome in adults with bacteremic pneumonia. Eur Respir J. 2010 Feb 11. [Medline]. Donowitz GR, Mandell GL. Acute pneumonia. Mandell GL, Bennett JE, Dolin R, eds. Principles and Practice of Infectious Diseases. 5th ed. Philadelphia, Pa: Churchill Livingstone; 2000. 717-43. Madeddu G, Fois AG, Pirina P, Mura MS. Pneumococcal pneumonia: clinical features, diagnosis and management in HIV-infected and HIV noninfected patients. Curr Opin Pulm Med. 2009 May. 15(3):236-42. [Medline]. Austrian R. Pneumococcal pneumonia. Diagnostic, epidemiologic, therapeutic and prophylactic considerations. 1986. Chest. 2009 Nov. 136(5 Suppl):e30. [Medline]. Clifford V, Tebruegge M, Vandeleur M, Curtis N. Question 3: can pneumonia caused by penicillin-resistant Streptococcus pneumoniae be treated with penicillin?. Arch Dis Child. 2010 Jan. 95(1):73-7. [Medline]. Cunha BA. Clinical relevance of penicillin-resistant Streptococcus pneumoniae. Semin Respir Infect. 2002 Sep. 17(3):204-14. [Medline]. Garnacho-Montero J, García-Cabrera E, Diaz-Martín A, Lepe-Jiménez JA, Iraurgi-Arcarazo P, Jiménez-Alvarez R, et al. Determinants of outcome in patients with bacteraemic pneumococcal pneumonia: importance of early adequate treatment. Scand J Infect Dis. 2010 Mar. 42(3):185-92. [Medline]. van der Poll T, Opal SM. Pathogenesis, treatment, and prevention of pneumococcal pneumonia. Lancet. 2009 Oct 31. 374(9700):1543-56. [Medline]. Garrouste-Orgeas M, Azoulay E, Ruckly S, Schwebel C, de Montmollin E, Bedos JP, et al. Diabetes was the only comorbid condition associated with mortality of invasive pneumococcal infection in ICU patients: a multicenter observational study from the Outcomerea research group. Infection. 2018 Jul 4. [Medline]. van de Beek D, de Gans J, McIntyre P, Prasad K. Steroids in adults with acute bacterial meningitis: a systematic review. Lancet Infect Dis. 2004 Mar. 4(3):139-43. [Medline]. [Guideline] American Academy of Pediatrics Committee on Infectious Diseases. Recommendations for the prevention of Streptococcus pneumoniae infections in infants and children: use of 13-valent pneumococcal conjugate vaccine (PCV13) and pneumococcal polysaccharide vaccine (PPSV23). Pediatrics. 2010 Jul. 126(1):186-90. [Medline]. [Guideline] Advisory Committee on Immunization Practices (ACIP). Preventing pneumococcal disease among infants and young children. Recommendations of the Advisory Committee on Immunization Practices (ACIP). MMWR Recomm Rep. 2000 Oct 6. 49:1-35. [Medline]. [Full Text]. [Guideline] Centers for Disease Control and Prevention (CDC); Advisory Committee on Immunization Practices (ACIP). Updated recommendation from the Advisory Committee on Immunization Practices (ACIP) for use of 7-valent pneumococcal conjugate vaccine (PCV7) in children aged 24-59 months who are not completely vaccinated. MMWR Morb Mortal Wkly Rep. 2008 Apr 4. 57(13):343-4. [Medline]. [Full Text]. Domínguez A, Izquierdo C, Salleras L, Ruiz L, Sousa D, Bayas JM, et al. Effectiveness of the pneumococcal polysaccharide vaccine in Preventing Pneumonia in the elderly. Eur Respir J. 2010 Jan 14. [Medline]. Grijalva CG, Poehling KA, Nuorti JP, Zhu Y, Martin SW, Edwards KM, et al. National impact of universal childhood immunization with pneumococcal conjugate vaccine on outpatient medical care visits in the United States. Pediatrics. 2006 Sep. 118(3):865-73. [Medline]. Centers for Disease Control and Prevention (CDC); Advisory Committee on Immunization Practices. Updated recommendations for prevention of invasive pneumococcal disease among adults using the 23-valent pneumococcal polysaccharide vaccine (PPSV23). MMWR Morb Mortal Wkly Rep. 2010 Sep 3. 59(34):1102-6. [Medline]. Rinta-Kokko H, Dagan R, Givon-Lavi N, Auranen K. Estimation of vaccine efficacy against acquisition of pneumococcal carriage. Vaccine. 2009 Jun 12. 27(29):3831-7. [Medline]. Centers for Disease Control and Prevention (CDC). Recommended Adult Immunization Schedule – United States, 2012 MMWR 2012 feb 3;61(4):66-72. [Full Text]. Recommended immunization schedules for persons aged 0 through 18 Years — United States, 2012. MMWR Morb Mortal Wkly Rep. 2012 Feb 10. 61(5):1-4. [Medline]. [Full Text]. Nuorti JP, Whitney CG. Prevention of pneumococcal disease among infants and children - use of 13-valent pneumococcal conjugate vaccine and 23-valent pneumococcal polysaccharide vaccine - recommendations of the Advisory Committee on Immunization Practices (ACIP). MMWR Recomm Rep. 2010 Dec 10. 59:1-18. [Medline]. [Full Text]. Use of 13-Valent Pneumococcal Conjugate Vaccine and 23-Valent Pneumococcal Polysaccharide Vaccine for Adults with Immunocompromising Conditions: Recommendations of the Advisory Committee on Immunization Practices (ACIP). MMWR Morb Mortal Wkly Rep. 2012 Oct 12. 61:816-9. [Medline]. [Full Text]. Hung IF, Leung AY, Chu DW, Leung D, Cheung T, Chan CK. Prevention of acute myocardial infarction and stroke among elderly persons by dual pneumococcal and influenza vaccination: a prospective cohort study. Clin Infect Dis. 2010 Nov 1. 51(9):1007-16. [Medline]. Black SB, Shinefield HR, Hansen J, Elvin L, Laufer D, Malinoski F. Postlicensure evaluation of the effectiveness of seven valent pneumococcal conjugate vaccine. Pediatr Infect Dis J. 2001 Dec. 20(12):1105-7. [Medline]. Kaplan SL, Mason EO Jr, Wald ER, Schutze GE, Bradley JS, Tan TQ, et al. Decrease of invasive pneumococcal infections in children among 8 children's hospitals in the United States after the introduction of the 7-valent pneumococcal conjugate vaccine. Pediatrics. 2004 Mar. 113(3 Pt 1):443-9. [Medline]. Karlowsky JA, Thornsberry C, Jones ME, Evangelista AT, Critchley IA, Sahm DF. Factors associated with relative rates of antimicrobial resistance among Streptococcus pneumoniae in the United States: results from the TRUST Surveillance Program (1998-2002). Clin Infect Dis. 2003 Apr 15. 36(8):963-70. [Medline]. Whitney CG, Farley MM, Hadler J, Harrison LH, Lexau C, Reingold A, et al. Increasing prevalence of multidrug-resistant Streptococcus pneumoniae in the United States. N Engl J Med. 2000 Dec 28. 343(26):1917-24. [Medline]. Song JH, Jung SI, Ko KS, Kim NY, Son JS, Chang HH, et al. High prevalence of antimicrobial resistance among clinical Streptococcus pneumoniae isolates in Asia (an ANSORP study). Antimicrob Agents Chemother. 2004 Jun. 48(6):2101-7. [Medline]. Cunha BA. Effective antibiotic-resistance control strategies. Lancet. 2001 Apr 28. 357(9265):1307-8. [Medline]. Bradley JS, Byington CL, Shah SS, et al. The management of community-acquired pneumonia in infants and children older than 3 months of age: clinical practice guidelines by the Pediatric Infectious Diseases Society and the Infectious Diseases Society of America. Clin Infect Dis. 2011 Oct. 53(7):e25-76. [Medline]. Shea KW, Cunha BA, Ueno Y, Abumustafa F, Qadri SM. Doxycycline activity against Streptococcus pneumoniae. Chest. 1995 Dec. 108(6):1775-6. [Medline]. Postma DF, van Werkhoven CH, van Elden LJ, Thijsen SF, Hoepelman AI, Kluytmans JA, et al. Antibiotic treatment strategies for community-acquired pneumonia in adults. N Engl J Med. 2015 Apr 2. 372 (14):1312-23. [Medline]. [Full Text]. Jones RN, Sader HS, Mendes RE, Flamm RK. Update on antimicrobial susceptibility trends among Streptococcus pneumoniae in the United States: report of ceftaroline activity from the SENTRY Antimicrobial Surveillance Program (1998-2011). Diagn Microbiol Infect Dis. 2013 Jan. 75 (1):107-9. [Medline]. Jones RN, Jacobs MR, Sader HS. Evolving trends in Streptococcus pneumoniae resistance: implications for therapy of community-acquired bacterial pneumonia. Int J Antimicrob Agents. 2010 Sep. 36 (3):197-204. [Medline]. Reuters Health Information. U.S. advisory panel recommends Prevnar 13 vaccine for elderly. Medscape Medical News. August 14, 2014. [Full Text]. Bonten M, Bolkenbaas M, Huijts S, et al. Community Acquired Pneumonia Immunization Trial in Adults (CAPiTA). Abstract no. 0541. Pneumonia 2014;3:95. Available at https://pneumonia.org.au/public/journals/22/PublicFolder/ABSTRACTBOOKMASTERforwebupdated20-3-14.pdf. Tomczyk S, Bennett NM, Stoecker C, Gierke R, Moore MR, Whitney CG, et al. Use of 13-Valent Pneumococcal Conjugate Vaccine and 23-Valent Pneumococcal Polysaccharide Vaccine Among Adults Aged =65 Years: Recommendations of the Advisory Committee on Immunization Practices (ACIP). MMWR Morb Mortal Wkly Rep. 2014 Sep 19. 63(37):822-5. [Medline]. [Full Text]. Mitchell AM, Mitchell TJ. Streptococcus pneumoniae: virulence factors and variation. Clin Microbiol Infect. 2010 May. 16(5):411-8. [Medline]. Hawser SP. Activity of tigecycline against Streptococcus pneumoniae, an important causative pathogen of community-acquired pneumonia (CAP). J Infect. 2010 Apr. 60(4):306-8. [Medline]. Grau I, Pallares R, Tubau F, Schulze MH, Llopis F, Podzamczer D, et al. Epidemiologic changes in bacteremic pneumococcal disease in patients with human immunodeficiency virus in the era of highly active antiretroviral therapy. Arch Intern Med. 2005 Jul 11. 165(13):1533-40. [Medline]. Park SY, Van Beneden CA, Pilishvili T, Martin M, Facklam RR, Whitney CG. Invasive pneumococcal infections among vaccinated children in the United States. J Pediatr. 2010 Mar. 156(3):478-483.e2. [Medline]. Pilishvili T, Lexau C, Farley MM, et al. Sustained reductions in invasive pneumococcal disease in the era of conjugate vaccine. J Infect Dis. 2010 Jan 1. 201(1):32-41. [Medline]. Ray GT, Pelton SI, Klugman KP, Strutton DR, Moore MR. Cost-effectiveness of pneumococcal conjugate vaccine: an update after 7 years of use in the United States. Vaccine. 2009 Nov 5. 27(47):6483-94. [Medline]. Flamm RK, Sader HS, Farrell DJ, Jones RN. Antimicrobial activity of ceftaroline tested against drug-resistant subsets of Streptococcus pneumoniae from U.S. medical centers. Antimicrob Agents Chemother. 2014. 58 (4):2468-71. [Medline]. [Full Text]. Brooks LRK, Mias GI. Streptococcus pneumoniae's Virulence and Host Immunity: Aging, Diagnostics, and Prevention. Front Immunol. 2018. 9:1366. [Medline]. Sputum Gram stain from a patient with a pneumococcal pneumonia. Note the numerous polymorphonuclear neutrophils and gram-positive, lancet-shaped diplococci. Courtesy of C. Sinave, MD, personal collection. Lobar consolidation with pneumococcal pneumonia. Posteroanterior film. Courtesy of R. Duperval, MD. 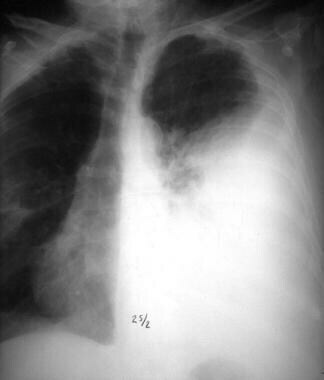 Lobar consolidation with pneumococcal pneumonia. Lateral film. Courtesy of R. Duperval, MD. Purpura due to pneumococcal sepsis in a 39-year-old man who underwent a splenectomy 20 years earlier. Courtesy of Thomas Herchline, MD, Wright State University, Dayton, Ohio. *Although PCV13 is licensed by the FDA for individuals aged ≥50 y, ACIP recommends routine vaccination with both PCV13 plus PPSV23 for individuals aged ≥65 y. †Those who received PPSV23 before age 65 years for any indication should receive another dose of the vaccine at age 65 years or later if at least 5 years have passed since their previous dose. *Congestive heart failure and cardiomyopathies, excluding hypertension. †Including chronic obstructive pulmonary disease, emphysema, and asthma. ‡Diseases requiring treatment with immunosuppressive drugs, including long-term systemic corticosteroids and radiation therapy. *In children immunized before age 12 mo, the minimum interval between doses is 4 weeks. Doses administered at age 12 months or later should be administered at least 8 weeks apart. † Providers should administer a single dose to all healthy children aged 24-59 mo with any incomplete schedule. ‡Children with sickle cell disease, asplenia, chronic heart or lung disease, diabetes mellitus, CSF leak, cochlear implant, HIV infection, or another immunocompromising condition. PPV23 is also indicated (see below).